The Kitchen Khiladi cooking competion is held in SF Bay area conducted by Cancer Institute(WIA) Foundation, Inc., (100% Affiliated with Cancer Institute(WIA), Adyar, Chennai, India). All the doctors there are dedicated to give free care to poor cancer patients.To know more, please visit the website http://www.cifwia.org . This is the first year CIF is conducting a cooking competition and be a part of it. The show is conducted by volunteers of CIF Cancer Institute Foundation) which is affiliated to the Adyar Cancer Institute in Chennai. About CIFWIA: Cancer Institute Foundation (WIA) is a US based organization (volunteer groups) dedicated to raise funds and support the Cancer Institute (WIA), Adyar in all aspects of Cancer Treatment and Research. The Cancer Institute WIA (Women India Association), Adyar, Chennai is One of A Kind Institution in India whose mission is to offer the best care when the disease strikes, regardless of who it is. The Institute has been delivering free cancer care for thousands of needy patients over the past 50 years. "Today, the Cancer Institute is the only free standing, non-profit, non-Government, autonomous institution that provides excellent care". 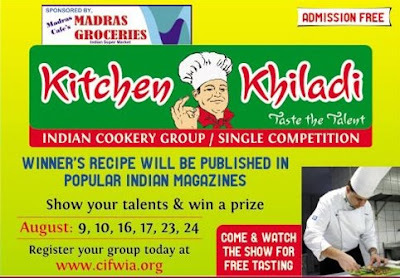 Kitchen Khiladi sponsored by: Madras groceries (Sunnyvale) and Hotel Bhimas (Milpitas). Do you want to show your cooking talents? Hurry up! participate in this wonderful competition. Don't miss this golden opportunity. Click here to register. It is free. You might be the iron chef SF Bay area. Thank you for publishing the AD. All of us at CIF work for a really noble cause and it was a pleasure to meet you last week. -Thanks. Thanks for sharing the information about Cancer Institute, India and the SF cooking competition. thanks for the info dear Mythreyee! sure Mythreyee! I will do that in my next post. I am so happy to help for a good cause.